Pacific Seeds has introduced a new high yield wheat variety that will hit the marketplace in spring. 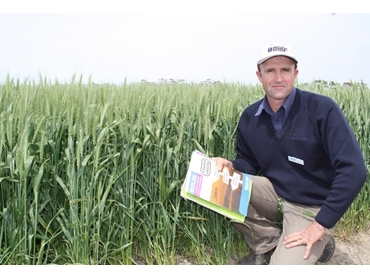 Trojan, the new high yielding APW wheat variety will be available for wheat growers in Victoria and South Australia, according to an announcement made by Pacific Seeds last week at AgriFocus. Pacific Seeds wheat technical manager Colin Edmondson announced at the Westmere field days that Trojan had made the jump from NVT to commercial production. Having performed well across a number of years and environments during its development, Trojan is now ready for release. Mr Edmondson explained Trojan is a main season variety with mid-long maturity similar to Yitpi and Pugsley, bred by LongReach Plant Breeders and trialled as LPB08-1799 from the time it was first entered into the National Variety Trials in 2011. Its key growing regions will be northeast and southwest Victoria and the southeast part of South Australia. Trojan has a short to medium plant height at maturity and is ideally suited to medium to higher rainfall areas; past performance also shows adaptability for early planting opportunities in dryer areas. This wheat variety promises to deliver growers good resistance to all rusts and is rated MR for stripe rust, is Boron tolerant (MT) and offers an excellent large grain package with good test weight and low screenings. Seed production is underway through Pacific Seeds’ regionally based seed producers, and farmers will be able to purchase seed for planting in 2014.